The history of the Community Cantata Choir is truly a tale of the Lord at work among devoted Christians! 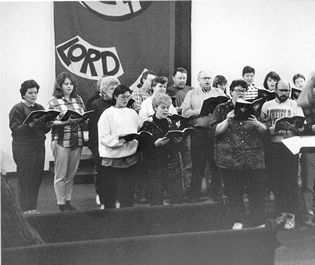 During 1987, Norlene Wolbert and Bill Bentley of Yamhill brought together a small group of people who wanted to make a joyful noise to the Lord during Advent. The group involved members of congregations in Carlton and Yamhill, some of whom participated in their own church choirs. Some didn’t have a choir. Many didn’t have much or any musical training, but all had a song in their hearts to sing! In those early years, the group numbered 20 or fewer and was led by Bill. Norlene provided all the materials as her gift and Yamhill’s Christian Church hosted rehearsals. Accompaniment was by piano only. Performances were offered in both Carlton and Yamhill. Even in the very beginning, the choir always has performed a Christmas cantata: The story of the birth of Christ in song and narration ~ HisStory. 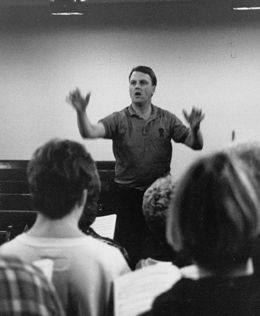 As the group stretched itself, tackling more difficult and lengthy choral material, Lee Schrepel became the director and the musicians began to purchase their own materials. The choir frequently has at least 40 musicians and commonly includes as many as 15 to 20 others in support roles. Music which is selected has always been a new publication, about 140-160 pages and 50-60 minutes in length, includes narration, five or six singing parts, and special parts for solos, duets and small ensembles. Additional accompanists from around the area have been added, including synthesizer, percussion, electric guitar, trumpet, flute, electric and upright bass, clarinet, trombone, violin, hand bells, sleigh bells and tambourine. Many in the “band” or “mini orchestra” have been able to participate year after year. Musicians have joined from at least a dozen communities in Clackamas, Marion, Polk, Washington and Yamhill counties. The choir is very non-denominational, perhaps including people who have no church home or church choir. As the choir’s needs have evolved, St. John Catholic Church in Yamhill has become our rehearsal host. The choir asks host congregations for a number of things: a tuned piano, enthusiastic and community-wide publicity, a staffed nursery and refreshments. A free will offering is always received in support of the YCAP Yamhill County Food Bank program. Over the past years our outreach ministry support through the Choir for local hungry & homeless people has facilitated donations totaling over $110,000. Some congregations have leveraged this offering with available matching funds from resources such as Thrivent for Lutherans, a fraternal insurance and financial management organization. These offerings have also assisted such ministries as Salvation Army, Share and Care, St. Barnabas’ Soup Kitchen and St. Vincent de Paul. What an amazing blessing! During the 2002 and subsequent seasons, a small children’s choir was included! Choir members were asked to secure personal teams of Prayer Partners to support their involvement in this musical ministry. As a result, people from across the nation have been praying for us and our efforts to share the Word with those who come to hear! During the 2003 season, a beautiful banner, an interpretive dancer and an interpreter of American Sign Language were added to the program. A wonderful banner was also a highlight of the 2010 season! During the 2006 season, it was necessary to purchase a sound system to use in our concerts. Thanks to the prayer and tremendous funding provided by friends, family & community of the choir we were able to purchase the sound equipment at just over $7,000. That equipment, plus the choir’s risers, necessitated that a small trailer be purchased for safekeeping and transport to rehearsals and programs. Gifts to the choir have allowed the sound system to be maintained and expanded to meet seasonal needs. Any surplus funds will help meet website expenses & may help provide samples of music for future use. As many as ten performances have been offered in a given season, though nine is the more accepted rule. Various seasons have involved performances in Amity, Lafayette, Beaverton, Carlton, Cornelius, Dayton, Forest Grove, McMinnville, Newberg, Sheridan, Sherwood, Yamhill and in the minimum and medium security chapels at the Federal Correctional Institution near Sheridan. The choir has also performed at the Oregon Zoo and at a few memorial and worship services. An intentional effort has been made to drop and add performance sites each season so that new audiences can hear the choir, permitting no congregation to develop an expectation that they will always be a host site.